Most States Haven't Delayed School Start Times : Shots - Health News Last year the nation's pediatricians said middle and high schoolers shouldn't start school before 8:30 a.m., so they can get much-needed sleep. But almost all schools start before that, the CDC finds. Maybe she goes to school in Wyoming, where no schools start after 8:30 a.m. The figure comes from a U.S. Department of Education survey conducted in the 2011-12 school year, so it predates the 2014 AAP recommendation for a later starting time. But assuming the situation hasn't changed much, most schools are not accommodating the sleep needs of teenagers. Countless PTA meetings and school board sessions have been devoted to appropriate start times for schools. Public health officials say teenagers need more than eight hours of sleep a night, and early start times stand in the way. "Obtaining adequate sleep is important for achieving optimal health," epidemiologist Anne Wheaton of the Centers for Disease Control and Prevention and her colleagues write in the latest Morbidity and Mortality Weekly Report, published Thursday. "Among adolescents, insufficient sleep has been associated with adverse risk behaviors, poor health outcomes and poor academic performance." But changing the starting time for schools isn't so easy. Bus fleets that serve children from elementary to high school have to be scheduled to accommodate more than just the sleep-deprived teenagers. Later starts also push after-school activities later into the day — and potentially into dark winter evenings. This survey finds that the push for later starting times has a long way to go. The survey of nearly 40,000 public middle schools and high schools found that only 17.7 percent started at 8:30 a.m. or later. 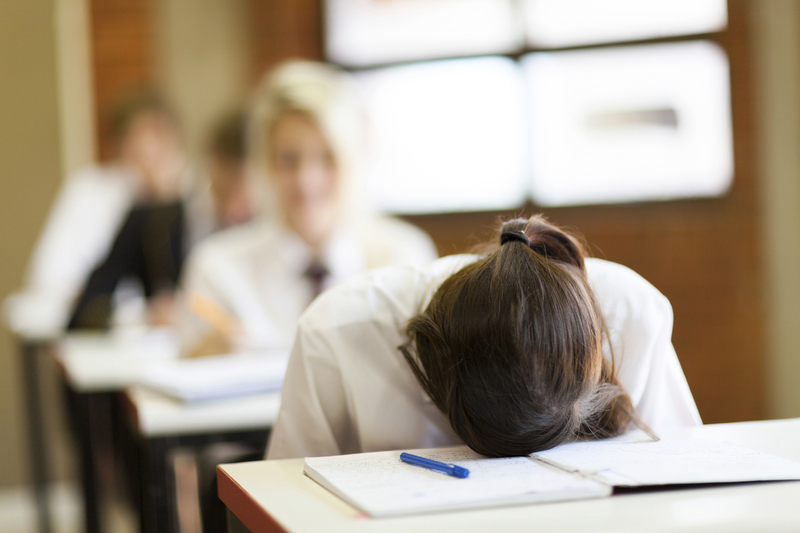 High schools alone were even worse, with just 14.4 percent starting at 8:30 or later. The northerly states of Alaska and North Dakota led the state-by-state tally published in MMWR, with nearly 80 percent of high schools and middle schools starting class after 8:30. The early bird states included Hawaii, Mississippi and Wyoming, where not a single school in the survey started later than 8:30 in the morning. Teenagers are biologically inclined to stay up later, so early school starts generally cut short their sleep, the CDC report notes. Parents can help teens get more sleep by enforcing earlier bedtimes, the report suggests, and by limiting the use of TVs, game consoles, smartphones and other screens in the bedroom (which parents know is far more easily said than done). "Among the possible public health interventions for increasing sufficient sleep among adolescents, delaying school start times has the potential for the greatest population impact," the study notes.